We have lived in this small cape in Connecticut for a little over 4 years. And what a blessing it has been. We went from 3500 square feet to 1100 square feet. I honestly didn’t even think twice about losing the space. I was just excited to have a charming older home. I always wanted one. Kevin actually flew to Connecticut and picked out this home. He did a good job. His favorite part was the yard! Mine was the built-in bookcases and that it was so close to downtown and the walking community. I LOVE that we can walk everywhere. The location was top on my priority list. I knew I could work with the home. I was looking through the photos online that we saw before we bought the home, only photos I saw, and thought what a difference! Today I am sharing all the before and after photos and a rough floor plan with the measurements of each room, something I actually get asked about often. Plus at the end asking a question “what would you do?” and something we have accomplished that has been a big goal of ours. There are a few things I want you to notice when you look at these before and after photos of our 1100 square foot cape. These are all things that you can do to get the most Bang for your Buck in a small space or really any home! Don’t stick to the traditional set-up! For instance if the previous home owners had their master bedroom in the largest room in the home does not mean you need to do that. In our case we knew we wanted a family room that could also be a guest room and a play room. So we turned the traditional master into a family room and we took the smallest room. A lot of small furniture actually make a small room look smaller! Try larger furniture and less of it. If you fill a wall with a large bookcase rather than a small scale bookcase and small chair can look busy. Notice how some bedrooms look a lot bigger than before even with larger furniture! Pick one paint color! Light paint that flows from room to room will make a small home look larger. We did our master bedroom a different color, because that room has very good light and we wanted it to feel different than the rest of the home. Renovation cost not including furniture $2200 aprox. We painted the walls first thing- Cloud Cover from Benjamin Moore. Removed the arch over the window seat and added an electric fireplace with real brick surround. We have the same amount of seating in this room that the previous home owners did, we just have the bonus of the fireplace now! I also loved the bamboo shades the previous home owners had in this room, but they were just getting worn down on the sides. So we switched them all to the lighter bamboo shades. We had the kitchen cabinets refaced, new flooring, new appliances, back splash, countertops, lighting and I could go on. But you get it. We brightened the kitchen and made it work for us! Including adding a dining table rather than having a separate room for dining. Biggest change was just painting the walls a dark gray and removing the chair-rail molding that made the walls feel short. We went with Gray from Benjamin Moore. We also wallpapered the ceiling to hide the ugly ceiling tiles. The bathrooms were the first thing we did when we moved in. We overhauled all of it. And by “we” I mean we paid someone. We were only here a couple weeks and got right on it. I wasn’t a blogger then so I don’t really have any before photo’s or of the process. But we are very happy and new that the bathrooms would give us the most return on investment, along with the kitchen. When we moved into this home Finn was just a dream! So we set this room up as a guest room. We had a queen bed in here. Never a dining table! That just didn’t make sense to me to carry our food past the bathroom to eat. We painted the walls and we did add wallpaper to the ceiling when we did Finn’s nursery. Also changed the window treatments. The girls shared a room from the start, even though we had an extra room downstairs. I knew that moving into a new home could be a little scary for them. And having each other to sleep with was the BEST idea we had! Plus I always wanted to do two twin beds in a room. We ripped out the carpet and had hardwood floors installed. They were super affordable. I was not blogging then, but these are the floors- Kahrs Artic Oak you can find it HERE . This bathroom was done the same time as our main floor bathroom. We loved the tile and soaker tub, but made rushed decisions and was trying to stay in budget. We ended up renovating the bathroom vanity and adding Azek to the walls about two years later. This is the room that was the previous home owners master bedroom. We decided to have it be our family room and guest room and never second guessed our decision! We did have the new wood floor put in here (same as the girls room). We had the new flooring installed in the week we moved in. We picked it out when we were still living in Utah. It was crazy, but glad that we did it right away. Looking back we would have waited to move in until the floor was done. Live and learn! I was itching to get new siding right when we moved in!! But we wanted to save up and pay for it in cash and also make sure that it was worth it. It was worth it just for the fact that I love it so much! We did renovate the front porch about a year after we moved in and that made a big difference for not a lot of money. Last summer Kevin updated the back deck too by removing the lattice. We actually paid off our cape this month!!!! This has been a big goal for us. I don’t share this to brag, I share this to show that it is obtainable to get a home within your means and be able to pay it off. We never wanted to go into debt to make improvements on our home. We wanted to be able to pay off our home before we did any additions. So now we can consider our next steps. One thing we are planning on right away is getting a new roof. We have thought about buying a flip house. Or adding on a small addition to this home. We would love to have a little laundry room upstairs. And extend our kitchen. But other than that we are totally happy with the size! It is always hard to decide. We want to do things to the home that we would enjoy NOW and also do things that are smart and a good investment. This beach community we live in a lot of the older homes (like ours) get torn down and a new huge 2 million dollar home gets built. So we would hope that our efforts to add on would not be wasted just because someone wants the land. Ultimately we do not know how long we are going to live here. We really wouldn’t move just to move. If we move it would be because we are moving out of state. The schools are a big factor in why we stay. Love to hear what you would do? Would you add onto this home or just move??? Wow! I love your home makeover. You were so smart about where you spent the money. My favourite parts are how you used the master upstairs for a family room and turned the dining room into Finn’s room. It just goes to show how thinking outside the box can make such a huge difference! The built-ins are so fun. Just removing a few shelves made them seem way bigger and less busy. Great idea! Would you ever consider flipping Finn’s room and the upstairs guest/family room… in the future, when he is older? 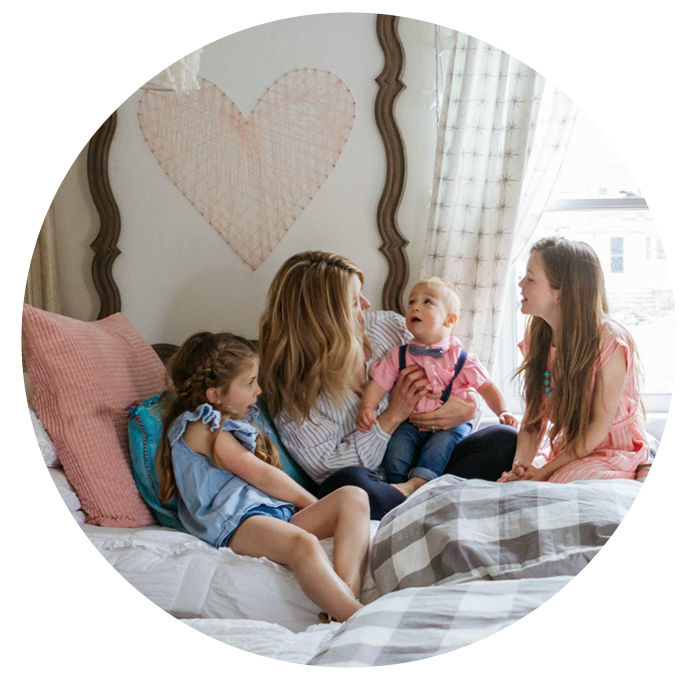 I know its a personal preference, but I don’t love being in the same space as my kids “bedroom” wise… 🙈. They are similar in size. I agree that an updated, fabulous laundry space would be an incredible asset! Congratulations on paying off your home! What a huge milestone for you guys! I loved seeing the before and afters of all of your renovations! You seem to think sort of like me- just because it may not be the ‘forever’ home, doesn’t mean we can’t make it beautiful / suit our needs while we’re here! Our home is just a touch bigger (around 1500 sq. ft.) and I love looking to your home for inspiration. Thanks for sharing, Brooke! Your home is just so charming and legitimately the first place I think of when I imagine my dream home and home decor! You are so very talented, Brooke! Same!!! To me, it looks like what a home should feel like, if that makes any sense. Thank you for sharing! Your house is very similar to mine in size and layout, which is how I first found you on Pinterest. We actually paid ours off last year, although it took us much longer than 4 years. Congrats! Such a good feeling. I would love to see you save a little house in your neighborhood for a flip. It makes me sad to hear that the older homes are being torn down. Wow! Congratulations on paying off your mortgage!! The feeling that comes with the freedom each month when you don’t have a mortgage to pay is amazing. It has given us the opportunity to say yes to travel that otherwise wouldn’t have been possible. I love all of the changes you made to your home. You made it work for your family! ❤️ I would definitely keep your home and make the changes you want. Thanks for always sharing your home and family! They are precious and so are you. Everything looks great. I especially love your kitchen and family room. Do you have honeowner’s fees where you live. That’s what I hate.,even though your house is paid off the taxes, insurance, and homeowners fees keep going up every year..
we don’t have homeowners fees, but yes, taxes are A LOT where we live! Move south!! We pay about 2500$ a year in property taxes!! I would never move if you are happy with your location 🙂 You can always make your home work for you as long as you love your location. Congratulations on your goal, that is amazing! 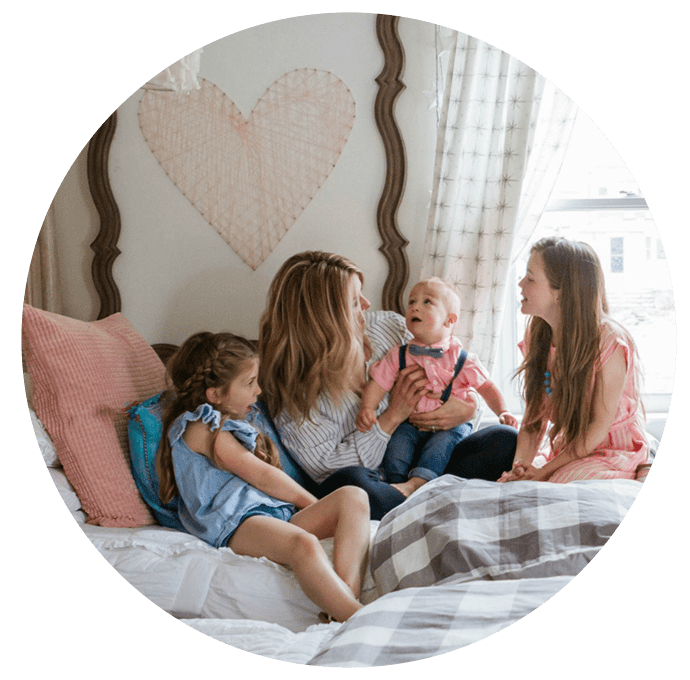 We are far from it but I love trying to accomplish small goals at our home to make it our forever home and one day pay it off 🙂 Love your blog and your positive attitude! Thanks for sharing! Congratulations on paying off your sweet house!! Love everything you’ve done to make it “home”! 🥰. I really love your master bed, could you please share where you found it? Love your blog so much!! Thank you for always inspiring us!! You have created such a lovely home, personal, not cookie cutter. I love that! I grew up in a 1 bath, maybe1000 ft home with our family of 5. We never gave a thought of what it wasn’t, we just loved home. We raised our 3 kids in an older 1 bath, 4 BDRM, with den that though larger was very cozy as rooms quite small. Our home. Yes, large open concept houses are beautiful, bright, and roomy, but you have shown, proven, a home is how you live in it, not the square footage. So much work and love has been put into all those changes…and it paid off! The before and after photos are stunning. Congratulations on paying off your mortgage! It makes my heart sing when a young couple has good discipline money-wise and refrain from living about their means. VERY SMART! Maybe you could share that story and any advice you have on getting that done in a future post. (If it’s not too personal.) Love, love, love your blog and all the ideas you’ve shared. That’s amazing congratulations! Can’t wait to see what you decide to renovate next. Thanks so much for sharing. We will pay off our house in another three years. Congratulations!! I love seeing the floor plan of your home. The biggest difference I see is how much more welcoming and cozy it feels. I love your eye for design. Upstairs laundry would be ideal if you plan on starting fit a long time, like elderly years long. Otherwise I would stick with what you have now. I really try to remind myself that people used to have 6-8 kids in our size houses. Less is more. Save the money for my Hawaii trips! I enjoyed the tour of your home so much! Especially since we downsized to a 1300 sq ft house two years ago for our retirement. All of the details you gave on each room were so helpful. I’ve been trying to convince my husband that taking the shutters off our house would make it seem larger and your picture just might do the trick. You have a lovely home! I would never move unless you could replicate the walkability quotient. This is an actual number (on Zillow, I think) and yours is likely around 85$ or more. If you go to the suburbs, it’ll drop hugely, and you’ll be spending your life in the car, ferrying kids around. In your current house the kids can gradually develop their skills of being on their own, walking alone to town and school, going places with a friend — on their own. This is incredibly important for their growth into mature adults. These are chances they won’t get if you’re far from town. A great location where kids can grow up walking to places on their own is something to be treasured. Add onto the house as your needs change, but definitely stay put! I’ve lived in neighborhoods with a high walkability quotient and in places with low ones, and my kids thrived much more where they could have some independence and play was not by appointment. Congrats on paying off your home!! 👏🏻🎉 can’t wait to see what you guys decide to do next! I’m so amazed at you guys for paying off your home!!! A huge congratulations!!! HUGE HUGE HUGE. Congratulations! That has to be a great feeling! Your home never feels small to me when I see it photographed or in your stories. I love how you’ve made great use of the space you have. As someone who is wishing to downsize in the near future and wondering how I will manage without all the extra space (and storage) your home and your great tips give me HOPE! Our colonial has an addition on extending the kitchen on the first floor and a laundry room on the second floor. Both of these were done before we bought the home, but we would not have bought it without the addition. A laundry room on the top floor where the bedrooms are is amazing and I am always grateful. I would do it. Congrats on paying off your cape!! Love a good before and after and your afters are so beautiful! Also, congrats on paying off your mortgage! That is an swesome achievement! Did I see a brick fireplace on the side roof of your house? I thought y’all didn’t have one? Congratulations on having your house paid off!! Love the house, it is so pretty!! we too moved from 3,000 to 2000. Our house was built in 1987 ceilings are 81/2 and I feel house is not as bright as previous. We have a big brick fireplace that they painted white over the red brick! I really love this one, just have to work on it a lol at a time. Thank You for all your ideas!!! I live in a 1500 foot Cape Cod with my daughter. I love that it is small and cozy, too. I took the previous owners’ lead and made the master bedroom into a TV room/play room since the combined living toom dining room is small. The one big difference is I don’t know if I will ever get to pay off my mortgage. I live in Alexandria (10 miles outside of DC) and even my little house was so expensive! I’d love to hear how you did it. I love every change you have made and I really appreciate that you share all these details because it makes it so much asker for me to make my own house a cozy, loved home. 😀 I would never move unless you were relocating, your set up and community seem worth the size trade off. Keep doing your friend’s and families mini renos if you need new blog posts. My husband recently installed bamboo blinds in our family room and we referred to your post extensively because our trim was thin and we needed to beef it up expensively so that we could install the blinds on the interior of the trim. He had asked my opinion about possibly installing them from the ceiling instead and I said, let me show you how my friend Grace added some wood to the trim to make it look perfect.. I love them all. We are also working on a 3 phase kitchen. Reno doing all the work ourselves and my husband is building new cabinets and refinishing our existing metal 1950s cabinets. I might paint our tile similar to yours. So really…Thank you sincerely for the inspiration. I hope you never move because no other house could be this adorable, nor would we be so anxious to see your next project. It sounds like a perfect location. My small home is paid off too but I was 56 at the time I am proud of that as you should be. Your talent in renovation on a reasonable budget is just stunning. It is clear that your kids are perfectly happy there and have learned that less is often so much more. I just love your home, your family, and every single story and post you do. I love this! We are in a small home and are actually selling our current home and buying a house so we have a smaller mortgage. Our goal is to be mortgage free and to have more freedom in our lives. Love your home! So impressed you paid off your house in 4 years! What was your plan and how did you accomplish that? Who doesn’t love a well done reno! I love your little Home and all the ideas you give. I am sure whatever you do will be the best for you and your family. You seem very close to your extended family, so if you moved closer to them that would seem like a reasonable move. I think whatever you do and wherever you are you will make it beautiful! I have a very similar cape except that I have to dormers on the front that adds finished space upstairs. Before you do your roof, consider that small addition. It keeps the footprint the same but uses every inch. When I tell people that I have 4 bedrooms upstairs and a full bath and 2 bedrooms downstairs with another full bath, they are shocked. It’s all about using every inch. I love having small, cozy rooms! I think I read once that you can walk to the beach. I would stay, stay, stay whether I could add on or not. But stay and add on would be ideal! Fantastic Reno! I really enjoy following you on instagram. You are easy to connect with and to listen to. Your advice is always helpful. These before and after pics are amazing. It’s easy to find your own inspiration out of how you set up your shots. In mentioning your next project being a new roof, I would love to offer my opinion amd expertise…. As I would for any “friend.” My husband and I are roofing contractors in Florida. We love to serve and feel a real duty in our business to be stewards in our community in the level of work and advice we provide. For the last 28 years, my husband has overseen every nail and always installs alongside our crew. He is on every project we install… Beginning to end and hours after doing final touches. I am a proud wife… so proud of the quality and integrity he gives. Now that I have tooted my horn, let me share that he has installed every brand of shingle… in addition to many other commercial and residential products. Florida weather is a different animal from snow and the north , but looking at the picture of the exterior of your home, a common problem evident in your roof is the streaking and fading I see. I would ask that you consider Atlas pinnacle pristine Architect shingles (in coastal granite) for your roof if you are considering shingles. Just a little background, we are not a certified installer of any brand because we will always only chose the best product. Our loyalty will always be to what is the best (thickest, most pliable) shingle on the market. We have been in business long enough to see and know which shingle has proven over time to perfom and look the best and look new the longest. Around 2007, Atlas reformulated the copper content in the granules and have partnered with Scotchguard 3m. They built in thier warranty to guard against streaking and fading. That is what makes your roof look prematurely aged. They have tripled the granule count to carry the Scotchguard logo and must do quality control of the granule count on every color run. No one else has built that guarantee in thier warranty. We have seen in the last 12 years, that claim true. Shocked and excited, we in the last 2 years, have shifted what we recommend and install. Also a common problem among most all other brands (except Certainteed), that we’ve seen and experienced and fixed is color variation in the same lot on a color run. Seeing a patch of slightly mismatched coloring in what should be all the same is so upsetting and disappointing when you are spending thousands! Wow! Im getting long winded. I guess you can tell we are passionate about roofs. Eek! I’ll stop there.Well, feel free to reach out as you research your roof project. Happy to share what I’ve (we’ve) learned. super helpful!!! Thank you so much! Yes- I hate the streaking the most and the color. Good advice! Would love to hear how you accomplished such a huge goal! Congratulations! Congratulations on paying off your home! I would add dormers to the front of the house when you do the new roof. I think it would add to the curb appeal and give more light into the rooms upstairs. I love everything you have done! I say stay and add on if you love the location. It’s our biggest regret right now. We loved our last house but it was just small for what we needed when get got pregnant with our 3rd and my husband needing a true home office for when he worked from home and did his podcast. We moved to our new house and so wish we would have stayed in our last house and just added onto it. We wish our amazing neighbors. You are smart to get it paid off. We did that as t ast as we could too. We have lived in our home for 28 years and have done 6 remodels. We hired the work out. Taking out a wood stove, removing a window, put in wainscoating, building bookcases, redoing all bathrooms (4), remodeled the kitchen (going on kitchen redo #2 now). E love our home and our location and had pavers and a patio put in last summer which really is pretty along with new landscaping some of which we did ourselves. If a house near you came up for sale, you could look and think about it but will have a lot to do probably on the new house but then that is half the fun! I love your home. I too live in a small 1600 sq. ft. Home and I love it! The neighborhood has become very popular for folks who come in and buy the land and build million dollar houses that take up all of the yard space (sigh) it saddens my heart because the feel of the neighborhood is being wiped away. I would stay and add on. If the schools are important to your family. That is the reason I have stay in my neighborhood. Congratulations on achieving your goal! That is huge! I love following you on Instagram, Facebook and your blog. Does that make me a stalker?!?! Lol! You are inspirational and you can see the love you have for your family, your home and your community. Thanks for being so uplifting. So my opinion, (and I too live in the same town as you), stay in your home until your jobs take you to another location. You have created a really a great space for your family. Enjoy the location to town, beach and your neighbors. When I began following you I thought your name was Grace (hahaha!) but realized that is your way of being, doing, acting and treating others with Grace. Such a bright spot in the world of the internet! Keep up the terrific work. WOW! Congratulations on paying off your home!! That’s so exciting! Paying off your home is a huge accomplishment and I would love to see a post on how you did it. We faced a similar decision when we had our last home…leave or stay and do an addition. We had 2 big factors that influenced our decision and biggest one being that we couldn’t imagine 5 full size people (thinking about all 3 of our kids would eventually be teens together) in that space and sharing one full bath. I was the youngest of 4 and I remember all the yelling and pounding on the bathroom door growing up. Thanks for showing your floor plan! It really helps in visualizing the room arrangements. Sometimes seeing it on paper is very different from what we imagine. Your LR is actually a little larger than I thought and it looks like you have good traffic flow. That makes such a difference, especially in a smaller home. Your home is the same size as the one I grew up in but has a MUCH better arrangement. I have to agree that if adding on a small addition is a viable option, I would go for it. As much as being close to the beach is appealing, so is being able to walk everywhere. When I visit my daughter, who lives in the NE, I walk just about everywhere. It’s wonderful to be near town (and at a coffee shop in less than 10 minutes) but still be residential. And of course, great schools are so important. 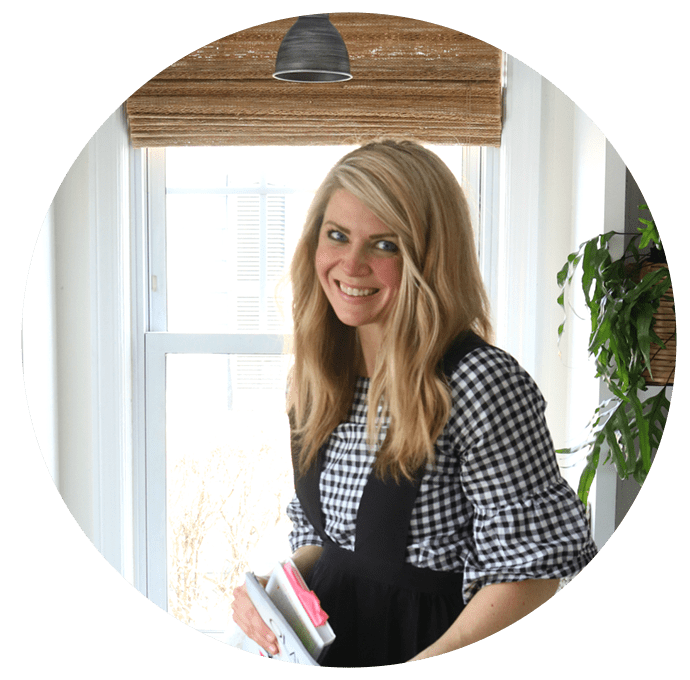 Really enjoy your blog, it’s so helpful and inspiring and your family is lovely. You have a beautiful home and have made the most of its size. I have a 900 sq. ft. home. 2 beds/1 bath. I have no mortgage, which is so freeing. I have been able to do improvements in cash. There are no basements in SE Texas. I love how you have the eating area in the corner of kitchen. I have a washer/dryer there. There may be a time when all kids would be upstairs and maybe w/d downstairs. Whatever you decide it will look great! My house is very similar, its about 30 x 30 with a little porch on the back…but the attic is unfinished and I dream of doing that except I always wonder where I could put the stairs and how I would lay it out, so I’m always inspecting your photos with stairs in them to see how exactly they look :). The floor plan gives a better idea. oh yay!! Glad it helped!